The reviewer received a copy of the book from the author. 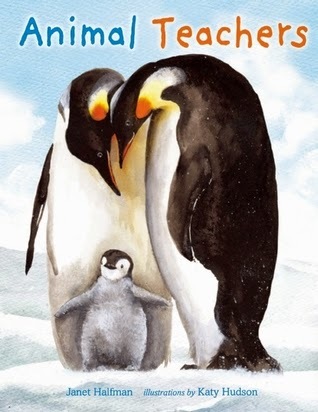 Janet Halfmann shares interesting facts about how animals learn from their parents in her latest nonfiction picture book. Children will enjoy learning how otters teach their young to swim, mother kangaroos teach joeys to kick for defense, and prairie dog pups learn to shout by copying adults. The accessible text combines narrative and expository styles and incorporates questions that will engage young readers. "Prairie dog pups live in big groups called towns. They have to know how to be heard among a crowd. So prairie dog parents give them shouting lessons. Chee-chee! Yip-yip! Wee-oo! Wee-oo! Wee-oo! "Do you yip? Can you bark? Or shout? Or yelp? How do you make yourself heard? Hudson uses a realistic style in the watercolor, ink and digital illustrations to depict animals in their habitats. A mother chimpanzee teaches her baby chimp to crack a nut, and penguins give singing lessons to their young. The interesting topic, engaging writing style and gorgeous illustrations make Animal Teachers an ideal read aloud for young children at home, school or in the library. Pair Animal Teachers with My First Day by Steve Jenkins or Born in the Wild by Lita Judge. Visit Katy Hudson's blog to learn how she created the illustrations for the book.